KernelCAD 3D debugger is an invaluable tool for any 3D software engineering, not necessarily KernelCAD-based. Step through your application's code and see the state of your objects immediately in 3D. 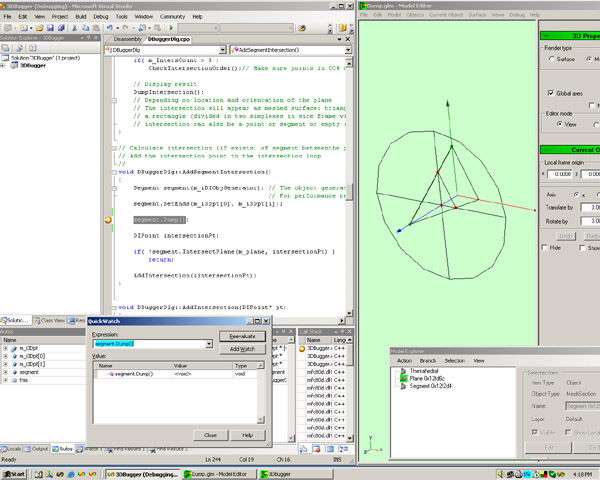 Instead of displaying text lines, KernelCAD 3D Debugger displays objects visually - in three dimensions. This saves any 3D developer the hassle of decrypting coordinates and allows them to see the object instantly. The interface is simple and intuitive. With tools such as Quick Watch (Visual Studio) no change to the application is required, even in debug builds. 3D Debugger is also an editor of native types of KernelCAD objects.